Property 36: Very elegant apartment, 18th century building. Marina waterfront. 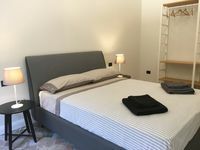 Property 38: Cosy & comfortable apartment in Cagliari, with parking space. Property 39: Cozy and colorful apartment 700 meters from the sea for up to 5 people. Property 46: Apartment with large porch near the sea.